The Chancellor Series is a member of our deluxe series. 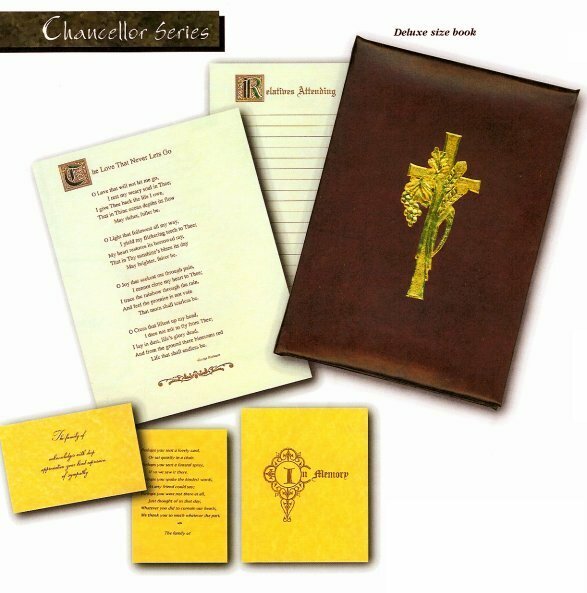 Book cover features a handsome gold foil embossed cross design. 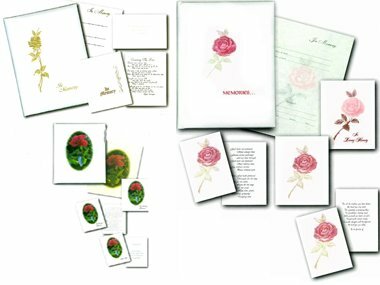 Matching pages and cards are printed on tan parchment. The Silver Cross Series has a silver cross on blue suedelux. Completing the series are cards with the same silver cross. 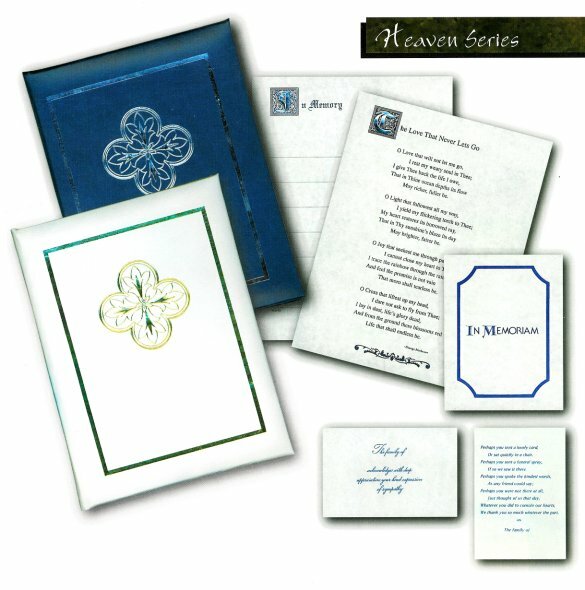 The Heaven Series features an elegant foil design on blue or white leatherette. The inside pages are also foil stamped. 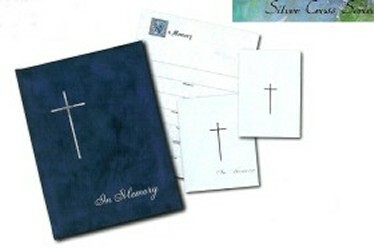 Pages, memorial folder and two different thank you styles are all printed on blue parchment paper. The Spanish Series and Children's Register are just two series in our line of specialized series created to personalize any service. 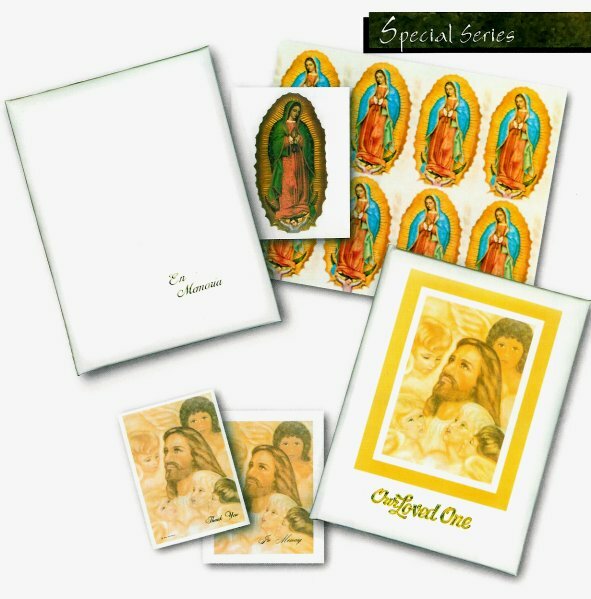 C137/74MV WHITE LEATHERETTE/GOLD/6 RING/SPANISH INTERIOR WITH OR WITHOUT "OUR LADY OF GUADALUPE" PICTURE AS FRONT PAGE. The New Wheat Series features a gold foil wheat design on a Suedelux. cover. 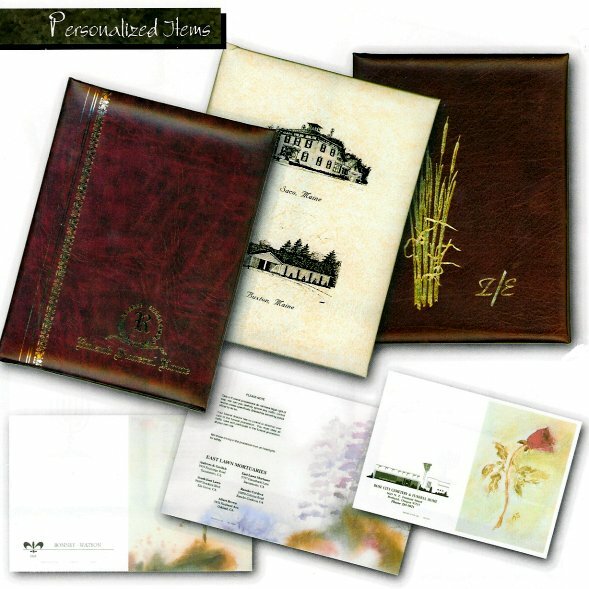 The same wheat design is displayed on the interior pages, memorial folder and thank you cards. A delicately embossed gold foil leaf design decorates the Suedelux cover of The Gold Leaf Series. The inside pages also feature gold foil stamping. The moire design of the Gold Cross Series adds shimmer and beauty. 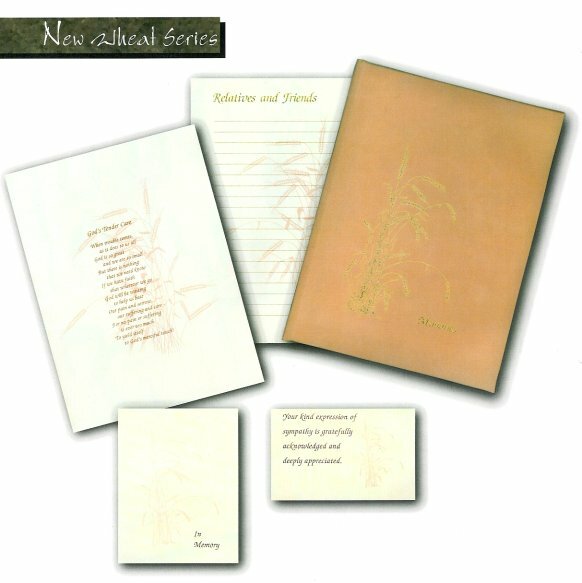 Inner pages, along with memorial folders acknowledgements, are gold foil stamped. 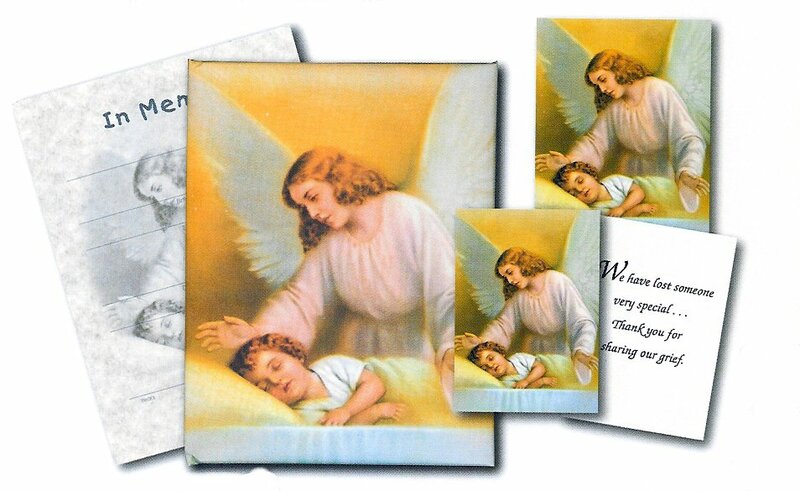 The protective Guardian Angel Series features a full color illustration of an angel watching over a sleeping child. This series has been designed specifically for families who have lost an infant or small child. 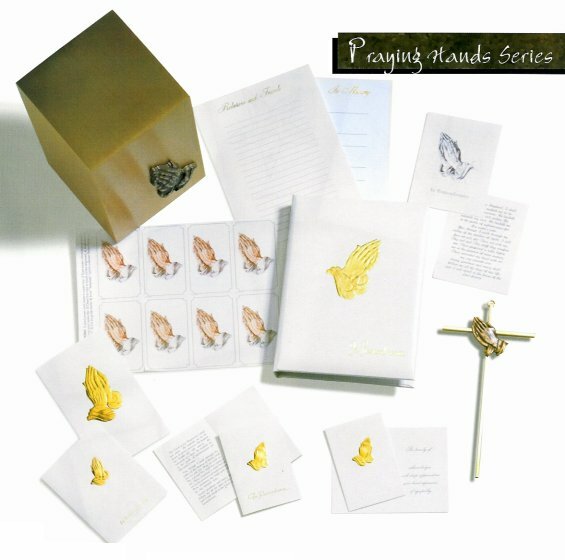 The Praying Hands Series combines gold foil with embossing to create a handsome series. 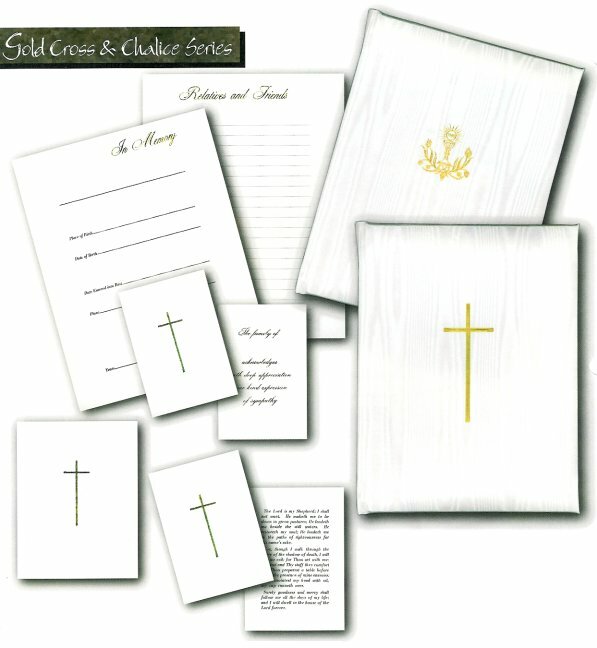 Matching crucifix, prayer cards, and memorial urn complete this series. 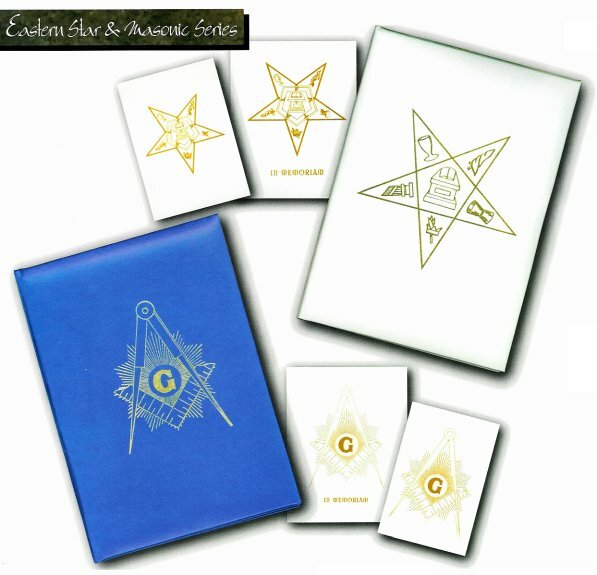 The gold foil cover design adds class to both The Eastern Star & Masonic Series. 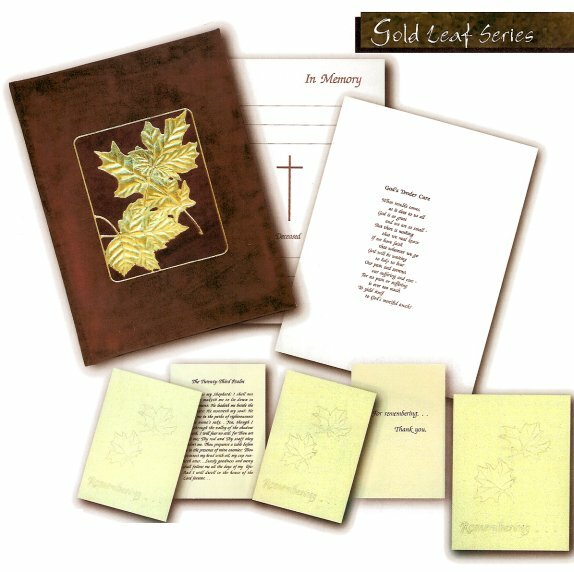 Matching acknowledgements and folders are printed with gold ink. 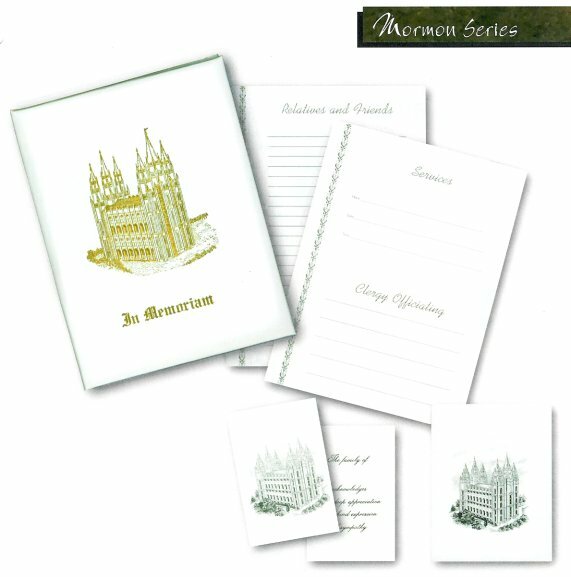 The Mormon Series features an illustration of the Salt Lake Temple printed in gold foil on the book cover and black ink on matching acknowledgments and memorial cards. Add a unique touch to each service with PERSONALIZED ITEMS. These items are designed especially for you, to offer the highest level of personalized service available. The Star of David is foil stamped on the cover of The Jewish Series register. 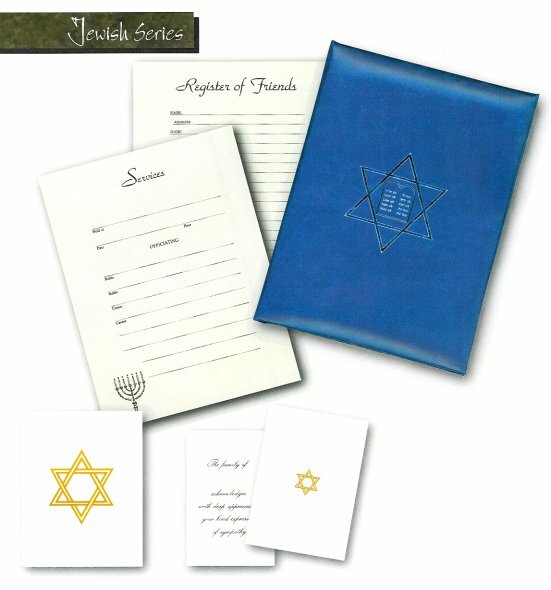 matching acknowledgements and memorial folders, printed in gold ink, also feature the Star of David design. Our wide variety and selection suits a variety of faiths. 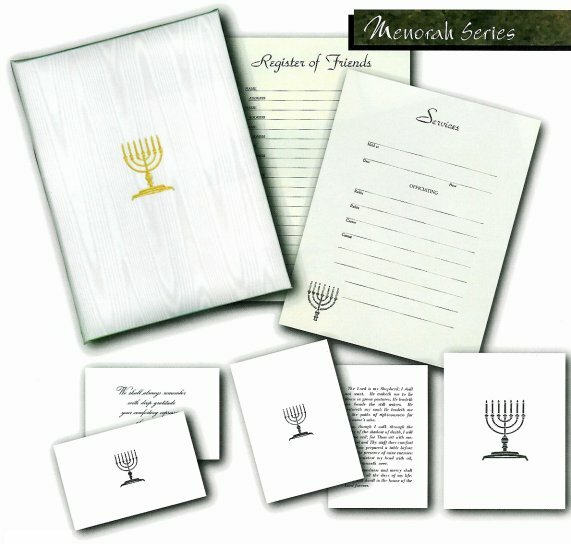 The Jewish Series delivers a personal touch for a special remembrance.